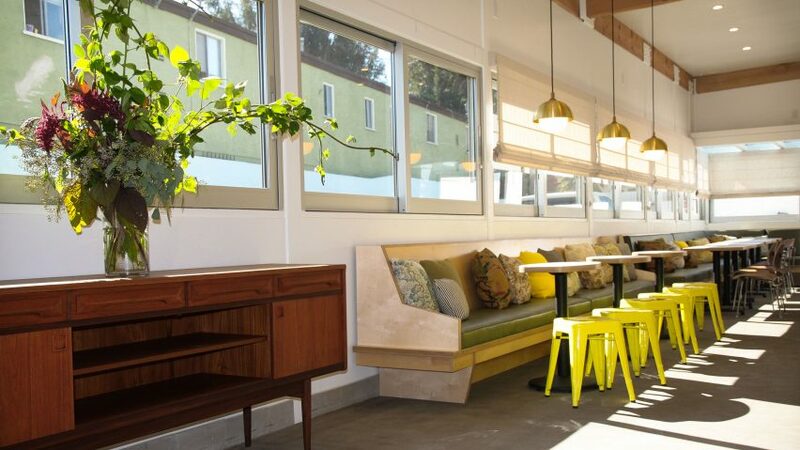 This cafe owned by Moby in Los Angeles was designed by local firm Studio Hus to reflect the musician's love of the mid-century modern style. 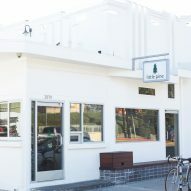 Moby opened the Little Pine vegan cafe inside a small white building in LA's Silver Lake neighbourhood earlier this year. The artist has strong opinions about architecture and interiors, and runs an architecture blog that has documented projects in LA since 2012. Last month, he hit out at architects "who think about stuff that can be photographed well, but who never actually plan on spending time in the spaces they create" – using a hotel room by Zaha Hadid as an example. Little Pine uses "nice but very, very basic materials" and is meant to suggest a "simple and unpretentious mid-century Scandinavian ski house", he told architecture magazine CLAD during the same interview. "Humans like certain basic things," Moby said. 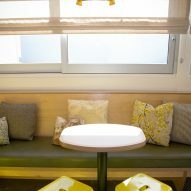 "We like light and we like comfort and we like safety." Taking his ideas and preferences into consideration, Studio Hus aimed to mix the light materials and atmosphere of Californian modernism with the rustic charm of Upstate New York. 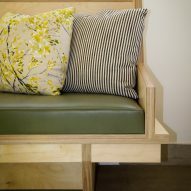 "We were commissioned by Moby to create a space that was an extension of the community – something that felt inviting and warm with a clean, mid-century aesthetic," said studio founder Tatum Kendrick. "Moby loves mid-century modern, but we wanted to warm it up with some eclectic touches that harken back to a welcoming lodge you would find in the Adirondacks where he has a home." 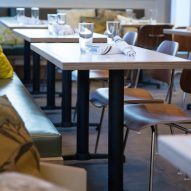 The firm designed custom banquettes, tables and benches for the compact space to pair with mid-century modern accents like vintage credenzas and chairs designed by Charles and Ray Eames. Hand-painted plywood tiles line one wall, while Moby's black and white landscape photography is mounted across other surfaces.